Our sewers and the drains in your home are only designed to carry the three Ps – pee, poo and paper. Every year there are thousands of blockages in these pipes, caused by people flushing the wrong things down the toilet or pouring fat, oil and grease down the sink. The cost of repairs and to clean up flooding can also add up to a hefty bill. 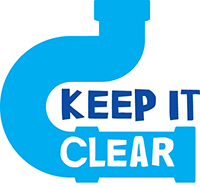 So, we are running a campaign between now and 2020 to visit homes in ‘blockage hotspots’ with advice on how to keep our sewers and your drains clear. Our team will be knocking on the doors of nearly 20,000 homes each year to share information about what and what not to flush down the loo or pour down the sink and drains. We’ll also be checking manholes and putting cameras in sewers to check they are working properly, and using high-powered water jets to clear any blockages we find. Below are simple steps you can take to help protect your home from flooding and help keep our environment clear. Click on an item in the list below to see how best to dispose of it. Fat, oil and grease (FOG) solidify as they cool and block pipes and sewers. They should be put in the bin or collected and recycled at the local tip to make biofuel. All wet wipes should be put in the bin. Wrap up and put in the bin. Dispose of them in special bags available from pharmacies. Flush the baby's waste down the toilet, then wrap the nappy and put it in the bin. Supermarkets also sell nappy disposal bags. Use special bags available from pharmacies. Throw these in the bin. Wrap these in something hard and protective and put them in the bin. These should be wrapped up and put in the bin. Return unused or out of date medicine to a pharmacy for safe disposal. Ask your local hospital or health authority for details of the nearest needle bank. Needles and syringes can cause injuries to refuse collectors or wastewater operatives. Your local council will have arrangements for disposing of chemicals. Contact your council for the details.